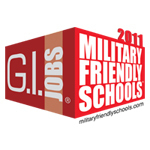 The 2013 Military Friendly Schools ® list was released recently by Victory Media and can be found at http://www.militaryfriendlyschools.com. This year’s list honors the top 15 percent of colleges, universities and trade schools in the country that are doing the most to embrace America’s military service members, veterans, and spouses as students and ensure their success on campus. This year’s Military Friendly Schools ® list criteria incorporate a survey of over 3,000 actual student veterans. This feedback provides prospective military students with insight into the student veteran experience at particular institutions based on peer reviews from current students. Now in its fourth year, the 2013 list of Military Friendly Schools ® was compiled through extensive research and a data-driven survey of more than 12,000 VA-approved schools nationwide. The survey results that comprise the 2013 list were independently tested by Ernst & Young LLP based upon the weightings and methodology established by Victory Media. Each year, schools taking the survey are held to a higher standard than the previous year via improved methodology, criteria and weightings developed with the assistance of an Academic Advisory Board (AAB) consisting of educators from schools across the country. A full list of board members can be found at http://www.militaryfriendlyschools.com/board. “A school’s inclusion on the 2013 list of Military Friendly Schools ® shows commitment to providing a supportive environment for military students,” said Sean Collins, Vice President at Victory Media and Director for G.I. Jobs. “As interest in education grows, we’re thrilled to provide the military community with transparent, world-class resources to assist in their search for schools.” Complete survey methodology is available at http://www.militaryfriendlyschools.com/method.